I have wanted to make some play silks for the girls for a long time. 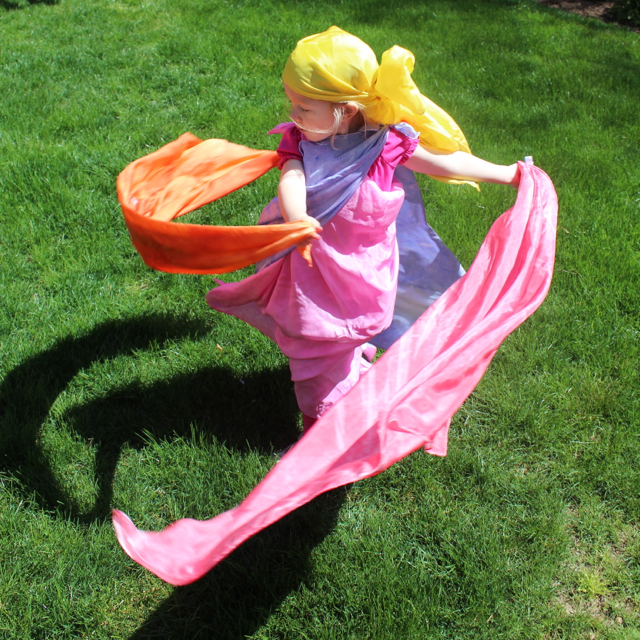 Play silks can be used in a multitude of ways in creative play to stimulate a child's imagination. They can be used as blankets, for dress up, for doll play, in dance, flags & forts etc If you don't have time to make your own silks and just want to buy them these websites will help you Sarah's Silks or Magic Cabin. 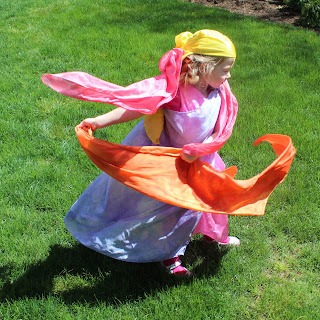 I wanted to be able to make the silks in fastest possible way which was kid friendly and non toxic. I googled about Kool Aid dying, winged it with the Easter Egg Dye and used the information here to experiment with tissue paper. 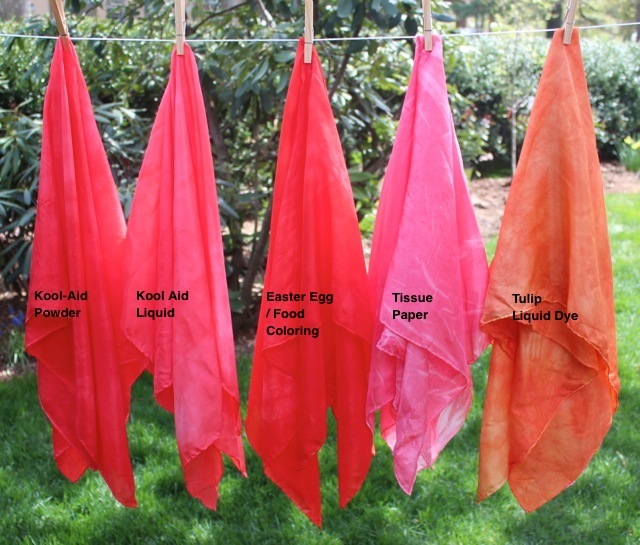 To see if these dying methods would succeed or fail I also made a sample without the kids using Tulip fabric dye. Here are the results. - Soak silk in hot tap water with a glug of vinegar while you make your mixture. - Mixture: We used 2 package of unsweetened Kool-Aid with 12 ounces of hot tap water + 4 ounces of vinegar. - Squeeze water out of silk and place silk in a pyrex bowl with the kool aid mixture. - Microwave for 2 mins - stir and let sit for 2 mins - do this step twice. - Rinse in cold wash (no detergent) & dry on hottest cycle in tumble dryer. Comments: There was some mottling on the fabric - perhaps this is just a product of microwave dying but I suspect if we had used 3 packets of Kool-Aid with 18 ounces of hot tap water + 6 ounces of vinegar so the silk was submerged at all times - this might have yielded better results. 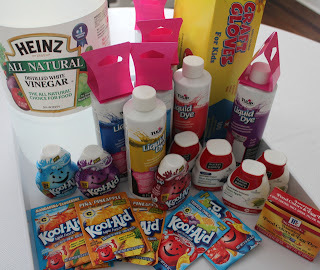 - Mixture: We used 1 liquid Kool-Aid with 12 ounces of hot tap water + 4 ounces of vinegar. - Microwave for 2 mins - stir and let sit for 2 mins - do this step twice. - Rinse in cold wash & dry on hottest cycle in tumble dryer. Comments: My girls really enjoyed squirting in the liquid. The mess was much more contained than with the powder sachets. The sugar in the liquid did not seem to affect the success of the dying - although the color is lighter. Some mottling - again I think we should have used more liquid. - Mixture: We used about all I had left in the bottle (maybe 1/2 to 3/4) with 12 ounces of hot tap water + 4 ounces of vinegar. - Squeeze water out of silk and place silk in a pyrex bowl with the mixture. - Mixture: 1/2 bottle of 0.25oz food coloring with 16 ounces of hot tap water + 6 ounces of vinegar. - Leave it there and stir occasionally - you will see when the dye has been absorbed as the liquid will become a lot clearer - approx 20 mins. - Rinse in cold wash & dry on hottest cycle in tumble dryer. Here is my pink, purple (a disaster - totally my fault), blue, yellow & green using this method. Comments: I did notice the water did still not run clear in the washing machine after the rinse cycle. So perhaps the microwave method does produce a more colorfast product. However for ease, safety etc for dying with the kids this still by far is my favorite. Different types of food dyes did produce different results with mottling, color flecks etc. - Lay out some glad wrap or cling film and put sheets of tissue paper 2 layers thick on top of some glad wrap or cling film - 2 layers thick. 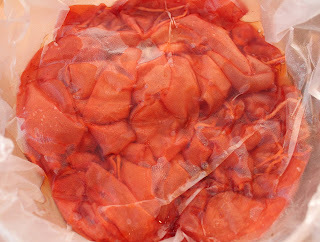 Lay your wet silk on top as flat as possible. - Lay more sheets of tissue paper on top of your silk. 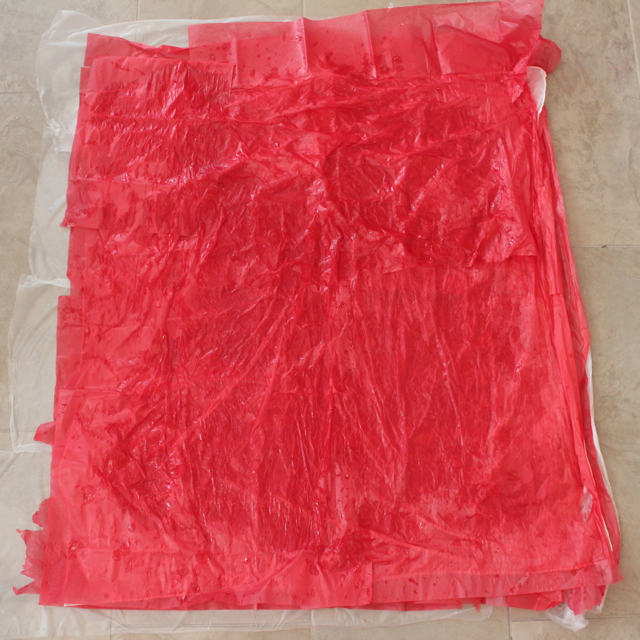 We used a total of 7 sheets of tissue paper - 2 layers underneath 1layer on top. - Sprinkle some of your water & vinegar solution on top of the tissue layers & silk. - Leave for several hours - we left ours over night. 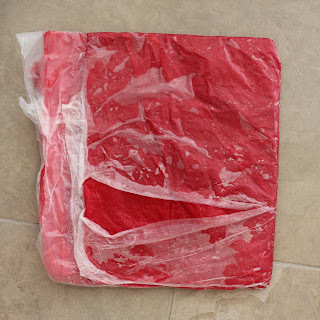 - Undo your package, peel off the tissue paper. Comments: I liked this a lot - for the fact that it is totally kid safe, the most interactive, tactile, no hot water or microwave is needed. However the process did take the longest. The pattern where the fabric didn't touch the tissue paper looks kind of cool. I think you could make some really interesting designs/drawings with the tissue paper too. Maybe we will try that next. Comments: The most disappointing result by far - mainly because of the color - it is not red - I think it is orange. Granted I didn't fully follow the instructions on the packet - they didn't have instructions for use on such a small amount of liquid/material. I'll be returning the other dyes we purchased and have not used in this line. 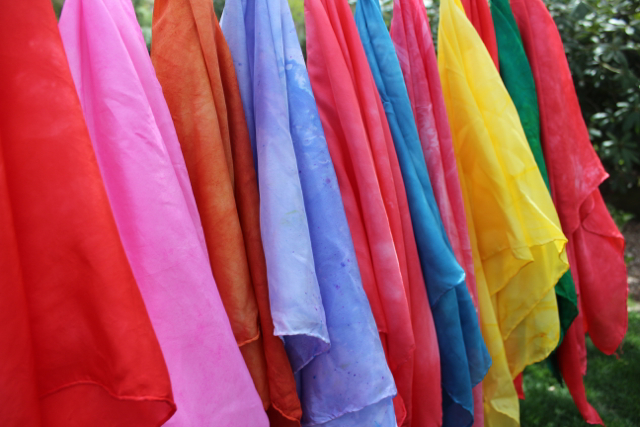 Further Notes: After all the silks were dry I used a hot iron on each silk. I used a front loading Electrolux Washing Machine which has a 20 minute cold rinse cycle without a spin. I used a front loading Electrolux Tumble Dyer that has a 14min 'fast dry' cycle which is at its 'sanitize' heat level (hotter that a hot cycle.) I purchased our plain silks from Dharma Trading they are 35"x35". I hope this helps you make your own play silks at home too. Very interesting. I've often thought of doing some dying, but thought it would be too messy. The tissue version resembles batik. Those are very pretty. 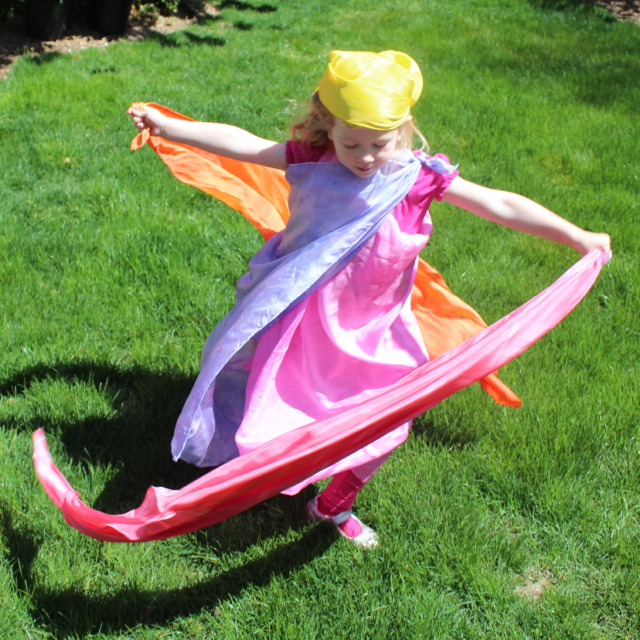 And never mind the kids - I think I could find uses for play silks too - wrapping up cushions and parcels comes to mind! thanks for sharing this. Thanks for giving us all that great info; the technique used and the results as well as what to try next time. I have pinned this for future reference - top job. 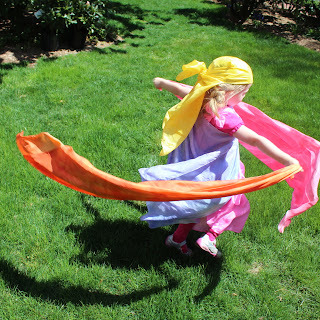 I love the pic of your little one playing with the scarves too. I love how you have tested a bunch of different ways to do this. 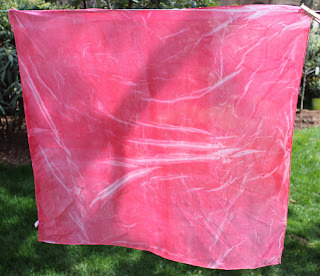 I've only dyed silks with Kool-Aid, and I think it works well (with vinegar + microwave). Mine are several years old, and they do fade over time. But still wonderful! I will sometimes use them to wrap birthday or holiday gifts instead of paper. Then the child gets the gift + a playsilk! 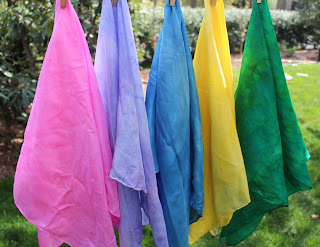 Using and dyeing your own silks is a new idea for me, so please tell me where you get the silks and are they real silk and what are the dimensions if you make them? Hi Jennifer - I didn't have any e-mail information for you - so I hope this information reaches you. I got our silks from Dharma Trading.com http://www.dharmatrading.com/html/eng/11699927-AA.shtml I used the 35" square silks. This seems to be the most commonly used size for play silks. Thank you so much for visiting Rachael Rabbit & leaving your comment. Thanks for linking to sarahssilks! Love the beautiful colors you dyed. I love that you've done all the work and are sharing this information - thank you! I'll be featuring you on The Crafty Crow! Thank you so much Cassi - we love The Crafty Crow! 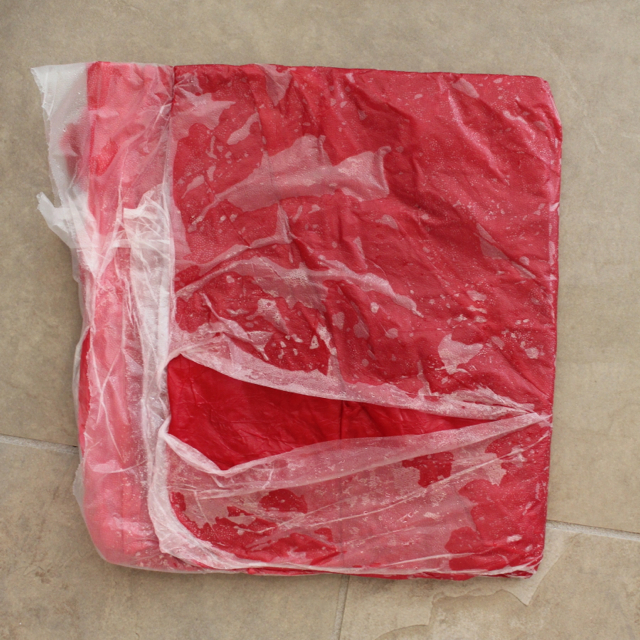 Hi Shannon - yes I just used regular tissue paper - the cheaper the better really as you want it to bleed a lot. Thank you for visiting Rachael Rabbit. Hi! You made all this look fun and easy! Thank you. Now that I have dyed several silks for my grand kids, I have a quick question. Is there a way to do incorporate stars on the silks that are not dyed? I have a dark one with white stars for sale but don't know if there is a way to do that myself. Nonni - I think you could probably paint or stamp on stars with batik wax perhaps - some kind of resist method that doesn't dissolve in water. You can iron the wax out afterwards. If you find another method or idea to try I would love to hear from you.